November 19, 2012 - Northrop Grumman has selected Garmin to supply the avionics suite for the new Firebird, an optionally piloted vehicle (OPV) designed for intelligence, surveillance and reconnaissance (ISR) missions. The Northrop Grumman Firebird is an intelligence gathering aircraft designed by Northrop Grumman's Scaled Composites design shop which can be flown remotely or by a pilot. At Scaled, it is known as the Model 355. It was unveiled on May 9, 2011. 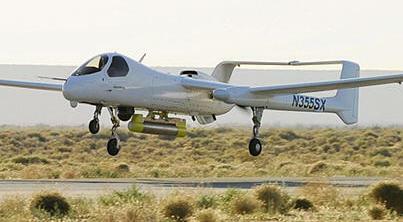 It was first flown in February 2011 and is considered to be an optionally piloted vehicle (OPV). The Firebird is equipped with a tailored version of Garmin’s latest touchscreen-controlled integrated flight deck system, leveraging the expandable and scalable attributes of Garmin’s commercial avionics technology to yield a highly-capable Commercial Off-the-Shelf (COTS) solution. The Firebird cockpit is equipped with three 14-inch, high-definition, widescreen displays. Multi-pane display capability effectively doubles the number of different presentations that the crew can control and view at the same time. This allows for primary flight information to be displayed to both the pilot and copilot along with additional displays capable of showing sensor data, moving maps, charts, engine indications and other important flight information. In addition, the cockpit is equipped with two touchscreen display/controllers that provide a centralized and intuitive interface to the system, giving pilots rapid access to the flight information they want. The touch controllers also allow for the control of external missions systems. For enhanced situational awareness and hazard avoidance, the Firebird is also equipped with Garmin’s Synthetic Vision Technology (SVT™), which presents a 3D depiction of terrain, obstacles, traffic and the runway environment on the flight displays. Garmin’s GWX 70 Doppler-capable weather radar and Garmin’s GTS™ 850 Traffic and Collision Avoidance System (TCAS I) are also on board the aircraft to provide the best possible picture of the operational environment. The triple widescreen displays, dual touchscreen display/controllers and flight management systems are also used in the ground control station that is used to fly the aircraft when it is operated as an Unmanned Aerial Vehicle (UAV). As a hybrid between a conventional aircraft and a UAV, the Firebird offers the flexibility to perform ISR missions based on the demands of the mission environment and whether manned or unmanned flight is optimal. The Firebird can support multiple types of ISR and communications sensor payloads simultaneously during flight including high definition full-motion video, infrared, radar and different types of electronic communications.